Minneapolis at the turn of 1934 was one of the major hauling centres of the United States, and the major distribution centre in the Upper Midwest with thousands of truck drivers employed in the city's trucking industry. The vast majority of drivers were unorganised, but there was a small group of organised drivers in the city who made up the General Drivers Local 574 of the International Brotherhood of Teamsters, a craft union that was attached, like most unions of the time, to the American Federation of Labour (AFL). For some time the membership of Local 574 had hovered around 75 people, and while they often took part in support of strikes of other unions, had never initiated one themselves.The Teamsters national leadership, under the conservative Daniel Tobin, took a dogmatic approach to allowing locals to initiate strike and, backed up by the tedious bureaucratic process of approving a strike embedded in the Teamsters constitution, made any kind of initiative very difficult for local unions. For a strike to be given the go-ahead, the proposal of strike action required a two thirds vote by the membership in order to authorise the action, and if any local struck prematurely, the leadership had the power to withdraw any strike benefits from the local union. As well as this, each local union was organised along craft and industry lines, making organisation between different workers in the same industry, such as drivers and distribution warehouse workers, very difficult. In stark contrast to the conservative leadership of the union, Local 574 had amongst its members a number of militants of the Communist League of America (CLA) (the American section of Trotsky's Left Opposition), which had been formed by expelled members of the Soviet backet Communist Party who had been expelled for Trotskyism in the early 1930s, and who had joined the Teamsters shortly after. A few of these members, including Ray Dunne and Carl Skoglund, both of whom played key roles in initiating the 1934 strike, were also expelled from the AFL Trades and Labor Assembly in Minneapolis along with 20 other communists in 1925. Local 574 had been trying, with little success, to organise the drivers in Minneapolis since the early 30s regardless of industry, in an attempt to create one large industrial organisation for all drivers, and in February of 1934 the turning point that led to the steamroller effect of workers joining the union en masse in the coming months arrived. A strike was called in the coal yards with the objective of gaining union recognition from the companies that owned the yards. Union recognition for workers was a difficult thing to obtain in Minneapolis, as since the turn of the century, the major force active during labour disputes in the city had been an employers organisation known as the Citizens Alliance, comprising of a council of prominent local property owners and various right-wing elements active in local politics. The Alliance took a strongly anti-union line, and was often not adverse to using violence towards picket lines to break up strikes. The strike in the coal yards was called on Feburary 7 and 65 out of 67 of the yards in the city were closed almost immediately by the workers, a Voluntary Organising Committee was also set up by members of Local 574 and members of other participating unions, which comprised several prominent men of the CLA. The Committee played a large part organising activities during the strike, as well as organising workers after the strike. The workers had also taken it upon themselves to ignore the bureaucratic trappings of the Teamsters strike approval policy and mediation procedures. Owing to the especially cold winter of 1934 and the need for coal to be able to leave the yards, the employers caved in after three days of strike action and blockades, and decided to recognise the union. The boost this gave Local 574 both in terms of membership numbers and credibility amongst drivers and warehouse workers was unprecedented, and by April its membership was above 3,000. By May, the number of organised drivers and warehouse workers in Minneapolis had grown to 5,000 and preparations were made for a general drivers strike, as many companies in the city were refusing to recognise the union. The strike was called on May 16 in spite of opposition from the Teamster national leadership, as again, strike approval procedures had largely been ignored. The workers demanded the recognition of the union, wage increases, shorter hours and the right of the union to represent "inside workers" - workers employed in distribution centres but who were not drivers, such as warehouse and loading bay workers. The strike was largely successful and nearly all trucking inside the city was brought to a standstill. Flying pickets were established and deployed from the union headquarters which took to patrolling the streets in a vast fleet of cars and trucks to ensure that no scab trucks were on the move, all of which displayed a special union sign so as to prevent confusion. A committee of 100 strikers, which had broad representation from workers of most hauling companies in the city, was established to direct day-to-day issues and relief to strikers families. It also established a daily newspaper, The Organiser, which became a useful organ of the union from which information and news about the strike could be circulated and which, at its height, enjoyed a circulation of about 10,000. A Womens Auxiliary group consisting of female supporters and the wives of strikers was set up by Carl Skoglund which, amongst other things, conducted solidarity work from the union headquarters, organised daily demonstrations at the city hall in favour of the strikers, manned picket lines and organised a food commissary, some members even took part in street fighting when workers clashed with police. The women also participated in setting up a small hospital for the strikers, which was manned by doctors and nurses supportive of the strike to which strikers injured in fighting with the police could go for treatment. An important link was also established by the strikers committee between the strikers and organisations of the unemployed, who made up a third of Minneapolis' working population. The support of the jobless towards the strike heavily undermined the employers efforts to utilise the unemployed to drive scab trucks. There were some scab trucks moving in the city, but the great majority of drivers had participated in the strike, including many who were not union members. May 19 saw the first major instance of violence, when police attacked a group of strikers who were attempting to stop scabs unloading a truck in the market area. The market was an important area during the strike and saw many scenes of violence, it was considered imperative that the strikers made sure that no trucks unloaded there because of its importance as a general distribution area, especially for farm produce. A few hours later another group of workers were attacked, this time after spotting scabs trying to unload newspapers at two of the major local newspaper's loading bays. The injured strikers were taken back to the union headquarters and were followed by police officers who, when they arrived, were not only refused entry by the strikers, but were fought outside on the street, leaving two of them unconscious. Major clashes between workers and police occurred again on May 21, when the police and members of the Citizens Alliance attempted to open the market for business. 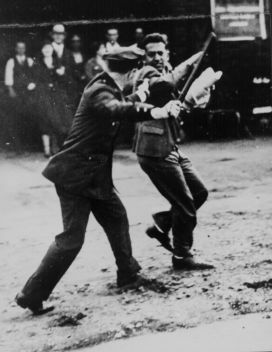 A large fight ensued with about 600 workers armed with clubs clashing with the police, some even driving a truck into the middle of the police lines so that firing on the strikers would have been impossible without the risk of shooting their own men. Over 30 police officers were hospitalised and no workers were arrested, although several, including women, were badly injured. Fighting intensified the next day after a rally of 20,000 workers and supporters had assembled in the market area on to which the police had advanced. The strikers success in driving back the police and Citizens Alliance deputies away from the market area lead to two deputies being killed, one of whom was a member of the board of directors of the Citizens Alliance. By this time many other workers in Minneapolis had taken the initiative and also gone on strike in solidarity, 35,000 building workers had walked out in protest of the police violence and many more struck for union recognition, the local AFL Labour Council organised financial support and organised strikes of other workers. They also allowing the strikers use of their headquarters to coordinate activity. The Citizens Alliance were quick to respond to this mass enthusiasm for the demands of the strikers and often utilised the conservative local press to attack them, launching a smear campaign in an attempt to paint the strike as a "communist plot". After several more days of pitched battles between workers, police and the 2,200 "special deputies" of the Citizens Alliance, as well as a failed attempted truce, the city authorities appealed to the state governor, Floyd B. Olson, of the Farmer-Labor Party, to deploy the National Guard. The Guard were mobilised, but Olson, wary of alienating the labour vote for which his party claimed to represent, didn't deploy them. Exasperated by the increasingly desperate economic situation they found themselves in and the refusal of the strikers to take notice of legal injunctions brought against them, the employers of the city agreed to the striker's demands, with the assisstance of mediation initiated by Olson, and a deal was approved by union members on May 25 which included union recognition and reinstatement for all sacked strikers. The strikers returned to work, but in the coming weeks it became apparent that employers were not abiding by the terms of the agreement, union members were being sacked, and between May and July over seven hundred cases of discrimination were filed by workers. The companies also refused to recognise the union rights of inside workers, which had been part of the agreement, and the strike was again taken up by the workers of Minneapolis on July 17. Movement of trucks in the city again came to a standstill, and on July 20, the most violent episode of the strike took place, later to be named "Bloody Friday". A large group of unarmed workers, who were rumoured to have been lured to a street corner by deputies in what the group believed was a scab truck, were fired on by over 100 police officers. Two pickets, John Belor and Henry Ness, were killed and over 65 others, many of whom were shot in the back, were wounded by the hail of bullets that came down upon the workers. The police violence left the working class of Minneapolis stunned, and offers of support and donations flooded in from other unions, and many workers took part in strikes to protest the shootings, including a one day strike of all of the city's transport workers. The Minneapolis Labour Review reported a crowd of 100,000 people in attendance at Henry Ness' funeral. A public commission set up after the strike later testified that, “Police took direct aim at the pickets and fired to kill. Physical safety of the police was at no time endangered. No weapons were in possession of the pickets”. Governor Olson immediately deployed the 4,000 National Guard at his disposal and enforced martial law in Minneapolis, picketing was banned and scab driven trucks, which were issued military permits, began to move again. The union, seeing this as an attempt to break the strike, demanded that all permits be revoked. In defiance of the martial law, the workers vowed again to return to the picket lines on August 1, however, on the night of July 31, the union headquarters were surrounded and raided by the National Guard, who arrested many of the leaders of the strike, detaining them in a nearby stockade at the State Fair Grounds. The union rank and file remained in control of the situation though in the face of this attempt to end the strike, and the next day called a mass rally demanding the release of the arrested men. 40,000 people marched on the stockade, the leaders were released and the captured union headquarters were returned. The strike carried on for several more weeks and by August 14 many scab trucks were moving in the city. However, the union refused to end the strike, even calling on the AFL to organise a general strike, a call that fell upon the deaf ears of its national leadership. The strike finally ended on August 21 through mediation, the employers and Citizens Alliance accepting the union's major demands. Elections were held in workplaces which had had employees on strike as to whether Local 574 would represent their workplace, to which the overwhelming majority of workers agreed to. Large pay increases were also later won by many workers through arbitration. The Citizens Alliance had been broken, and with it the backbone of resistance towards union organisation in Minneapolis. Workers in many other industries began to organise themselves, and the city maintained a strong union presence throughout the 1930s. The strike was instrumental in building a strong union tradition in Minneapolis and across the Midwest, with a writer of the Minneapolis Labour Review later noting that, “The winning of this strike marks the greatest victory in the annals of the local trade union movement...it has changed Minneapolis from being known as a scab’s paradise to being a city of hope for those who toil". The strike also often served as an example to workers participating later in the massive labour struggles of America that occurred until the late 1930s, of how a strong rank and file controlled local union can act, with massive public support, successfully, and independently of the central organs of a conservative and bureaucratically constrained national organisation, for the wide benefit of its members. In Minneapolis there's this Aquatenial thing, which is a bunch of summer festivals, concerts, etc. that is supposed to be about the celebration of the state's 10,000 lakes. This is going on right now, and I'm reminded that supposadly, this was created by the buisness community to counter the Teamster's huge picnics commerating the '34 strike. I need to find a source for this, but last year when I came to the TC, I went to an event on the '34 strike at MayDay books and the historian dude, who is a older guy who was related to some participants of the strike, said this. Also, according to this article, tomorrow is the anniversary of 'Bloody Friday'.